Bonnie Swain Schindly has been writing professionally since 1981. She was a reporter and columnist for the “North Hills News Record” and “Kittanning Leader Times” newspapers in Pittsburgh. She also has worked in corporate communications and human resources since 1990. She holds a Bachelor of Arts in journalism from Temple University. Health-care professionals recommend physical activity as a key ingredient to any stress-management initiative. They suggest that playing sports and getting regular exercise can calm your worries and clear your mind, according to the Anxiety and Depression Association of American. And it’s not just veteran athletes who achieve these feel-good moments — even people who are out of shape can feel tension start to subside as they understand how participating in a sport relieves stress. As with any fitness program, seek your doctor’s advice as you get started. Pumping up a sweat releases mood-boosting hormones inside the brain called endorphins that swirl through your system and generate a buoyant feeling. This optimistic rush is nicknamed the “runner’s high,” but it’s felt among participants of many sports including tennis, hiking and basketball. The upbeat aftermath of one aerobic exercise session can last up to 90 to 120 minutes, the American Council on Exercise says. Electrical activity that’s recorded in tensed muscles shows a decrease after a workout, according to the American Council on Exercise. Medical researchers also report noticeable drops in individual cases of hyperactivity and jitters in the aftermath of exercise. 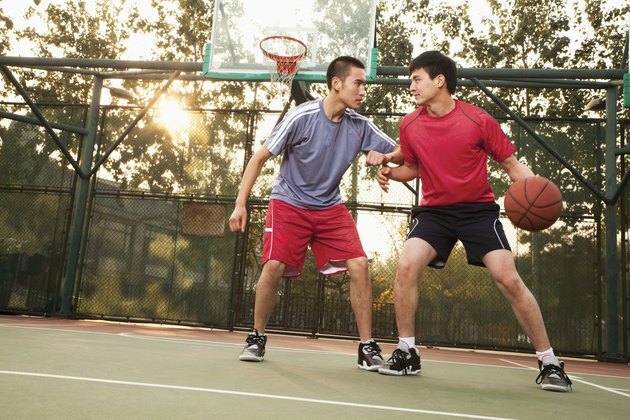 Taking up a sport can relax blood vessels, reducing heart rates and blood pressure that often accompany worry. The fight-or-flight response in challenging situations can cause a buildup of stress and glucose in your body. The American Diabetes Association recommends taking up a sport — whether it’s ballroom dancing or bicycling — to help your body more effectively process the tension. Participation in a recreational sport relieves stress by drawing your concentration toward your activity and away from that pile of responsibilities waiting for you at home and at work. As you swing your racquetball racket or paddle your kayak, you focus on your body’s movements and temporarily forget about your other stress points. This diversion acts like a form of meditation. People who routinely engage in sports often experience a sense of accomplishment after a workout, and this soaring self confidence also can melt tension. Workouts push you to adopt other healthy behaviors. Your indoor soccer league or evening hoops game encourages you to consume nutritious meals, snacks and beverages. Those rounds of touch football and weekend nature hikes help you shed pounds. Sleep disturbances often are linked to tension and anxiety, and sports participation improves your nightly bedtime routine. As you conquer each of these healthy changes, your body continues to achieve overall fitness and becomes more effective at handling your stress levels.